This page contains a tutorial that permits to create a simple Finite State Machine based on the NetEditor library. The maven module related to this step is: org.arakhne.neteditor.fsm:fsm-constructs. The Finite State Machine language is composed of the constructs: state, transitions, start point, end point. The FSM diagram contains three types of nodes: state, end point, and start point. It is recommended to create an abstract class that is common to all the implementations of these nodes. Each node of an FSM contains only one anchor. The AbstractFSMNode class extends the class StandardMonoAnchorNode, which is the implementation of a node with a single anchor inside. The generic parameters are the types of the graph, node, anchor and transition supported by the implementation (here the FSM classes). The constructor of the super class takes an instance of anchor as parameter. The FSMAnchor is used. The AbstractFSMNode class permits to simplify the use of the generic parameters. The FSM state is defined in the class FSMState. A state has a name, an action to execute when entering inside the state, and action to execute when exiting from the state, and an action when staying in the state. The class FSMState extends the abstract FSM node class. Three attributes are added to store the three actions for the state. The getter functions are added for each of the three attributes. The setter functions are added for each of the three attributes. Note that the attributes are assumed to be properties of FSMState. If the setter functions are firing property-change events when the value of an attribute is changing. To properly save and load a FSMState class from an external file, we must override the functions getProperties and setProperties. The values of the three attributes must be replied and set by these functions, respectively. Note that the function propGet is an utility function provided by the super class. It permits to retreive the properties and cast it to the proper type in one call. Do not forget to invoke the super implementations. The FSM transition is defined in the class FSMTransition. A transition has a name, an action to execute when transition is traversed, and a guard (a condition) that must be true to traverse the transition. The FSMTransition class extends the class StandardEdge, which is the implementation of an edge. The generic parameters are the types of the graph, node, anchor and transition supported by the implementation (here the FSM classes). Three attributes are added to store the action and the guard. The getter functions are added for each of the two attributes. The setter functions are added for each of the two attributes. Note that the attributes are assumed to be properties of FSMTransition. If the setter functions are firing property-change events when the value of an attribute is changing. To properly save and load a FSMTransition class from an external file, we must override the functions getProperties and setProperties. The values of the three attributes must be replied and set by these functions, respectively. Note that the function propGet is an utility function provided by the super class. It permits to retreive the properties and cast it to the proper type in one call. Do not forget to invoke the super implementations. To help the developer to connect the FSMTransition to two FSMState instances, two helpful functions are added: setStartNode and setEndNode. These functions set the start anchor and the end anchor of the edge to the single anchor of given nodes. The FSM start point is the point from which the simulation of the FSM must start. It is not a state by itself, but it is an AbstractFSMNode because it should be link to other FSM nodes with FSM transitions. The class FSMStartPoint extends the abstract FSM node class. The FSM end point is the point at which the simulation of the FSM is stopping. It is not a state by itself, but it is an AbstractFSMNode because it should be link to other FSM nodes with FSM transitions. The class FSMEndPoint extends the abstract FSM node class. The anchor is a construct provided by the NetEditor library to help to define how the edges and the nodes are connected. The implementation of the anchor must defined functions that permits to test if a node and an edge could be connected together. The class FSMAnchor extends the StandardAnchor, which is providing a standard implementation for anchors. The function canConnectAsStartAnchor must be overridden to specify when an AbstractFSMNode can be connected to the start of a FSMTransition. The start of a FSMTransition cannot be a FSMEndPoint. If the current anchor is binded to a FSMStartPoint then the other side of the FSMTransition must be a FSMState to accept the connection. In all the other cases, the connection is accepted. The function canConnectAsEndAnchor must be overridden to specify when an AbstractFSMNode can be connected to the end of a FSMTransition. The end of a FSMTransition cannot be a FSMStartPoint. If the current anchor is binded to a FSMEndPoint then the other side of the FSMTransition must be a FSMState to accept the connection. In all the other cases, the connection is accepted. The class that is representing the FSM is FiniteStateMachine. According to the NetEditor library, the class FiniteStateMachine is a type of graph and it extends StandardGraph with the appropriate generic parameters. The maven module related to this step is: org.arakhne.neteditor.fsm:fsm-figures. All the language constructs should have a figure to be rendered. The figure class FSMEndPoint extends the class CircleNodeFigure which the implementation of a circle provided by the NetEditor library. The function paintNode must be overridden to draw the end point in a proper way. The graphical context is not a AWT Graphics2D instance, but is is a ViewGraphics2D instance. Why? First, Graphics2D is not dedicated to vectorial drawing, and ViewGraphics2D is. Second, Graphics2D is an AWT implementation, and ViewGraphics2D is platform-independent (AWT, Android...). The ViewGraphics2D graphical context distinguishes the outline and the interior of a draw. The function draw is able to draw the outline and the interior at the same time. The functions setInteriorPainted and setOutlineDrawn permits to enable or disable the drawing of the interior and the outline, respectively. In opposite to the famous Graphics2D, which has one current color, the ViewGraphics2D distinguishes the color used to draw the outline and the color used to draw the interior. The function getCurrentViewBounds permits to retreive the bounds of the figure. The functions beginGroup and endGroup permits to group the drawn element into a single draw. Grouping is very useful when the figure should be exported into vectorial formats such as SVG. The figures for the FSMStartPoint, FSMState, FSMTransition, and FSMAnchor are coded in a similar way. 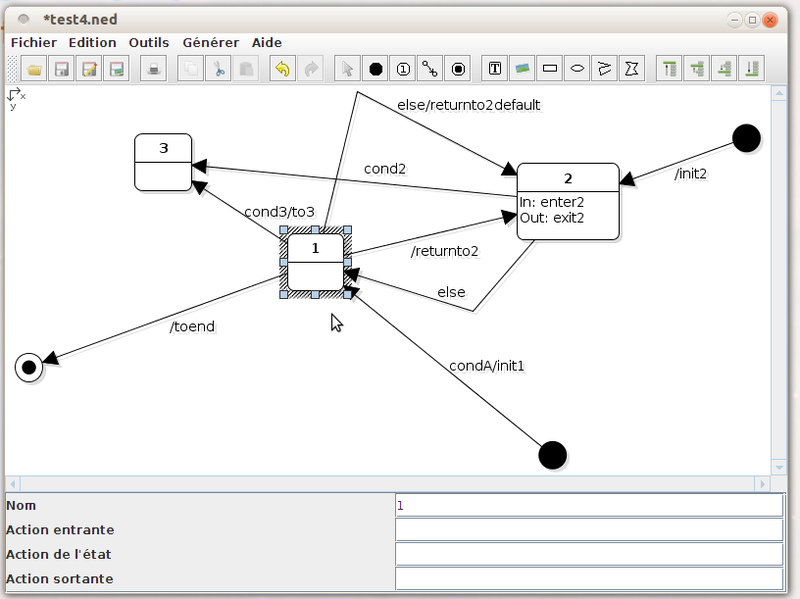 The NetEditor viewer requires to have a figure factory to create the figures when they are not yet associated to graph elements that may be rendered. The class FSMFigureFactory is the implementation of a figure factory dedicated to the FSM classes. It extends the class AbstractStandardFigureFactory, whish provides a standard implementation for factories. The function createFigureFor(UUID, FiniteStateMachine, ModelObject, float, float) is invoked to create a figure for the given model object (which is always a node) at the specified position. The following implementation creates the corresponding figure for the FSM elements. If the figure to create is for a FSMState, then the function is also creating the figures for the FSMAnchor. The function createFigureFor(UUID, FiniteStateMachine, ModelObject, float, float, float, float) is invoked to create a figure for the given model object (which is always an edge) from the specified point to the given point. The following implementation creates the corresponding figure for the FSM transition. The function createSubFigureInside(UUID, FiniteStateMachine, Figure, ModelObject) is invoked to create the subfigure inside the given figure for the specified FSM element (usually an FSMAnchor). The maven module related to this step is: org.arakhne.neteditor.fsm:fsm-editor. The FSM editor is a frame that contains the NetEditor viewer, which is an instance of JFigureViewer. The standard way to create the editor is illustrated in the following code.